The slag forms from the gangue component of the ore, the fuel ash (approximately 5% of charcoal is mineral oxides, hence 100kg of fuel generates 5kg of ash), and reaction with furnace lining. The morphology of the slag characterises the furnace technology through the method used to remove the slag, e.g. flowed tap slag, slag block, furnace slag, furnace bottom. 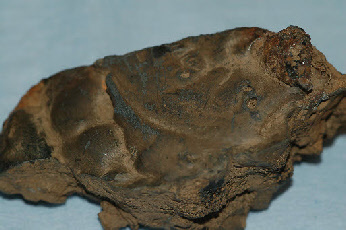 Smelting slags comprise iron silicate (solid solution of fayalite), free iron oxide (usually wustite) in a glassy matrix. A fourth phase e.g. hercynite, may also be present. The quantity of free iron oxide present is indicative of the efficiency of the process. Little or no free iron oxide indicates a highly efficient process. Large volumes of free iron oxide indicate an inefficient smelt. Iron smelting slags are dominated by oxides of Mg, Al, Si, P Ca, K, Mn, Fe. Minor oxides of Na, Ti, V. The slag composition relates to the ore used etc, but they cannot be clearly differentiated on the basis of bulk composition. There have been significant advances on trace elemental analysis of slag, however it is not clear what question is being asked of these analyses, and due to poor understanding of the smelting/slag formation processes the data is of limited value. McDonnell J.G. 1991 A Model for the Formation of Smithing Slags. Materialy Archeologiczne XXVI 23-27.